BACKGROUND AND PURPOSE: Recently, we experienced several technical problems that were directly related to new designs of Guglielmi detachable coils (GDCs). We herein present cases involving those problems and propose probable causes. METHODS: We reviewed the clinical and angiographic data of 269 consecutive patients with intracranial aneurysms who had been treated with GDCs between May 1996 and October 2001. We focused on newly encountered technical problems: spontaneous premature coil detachment, backward slipping of the coil into the microcatheter lumen after detachment, and undesirable detachment of the coils at the parent artery. The occurrence and clinical consequences of the problems were investigated before and after the introduction of a new GDC (SynerG) design. Additionally, to confirm the potential causal relationship, in vitro observations and simulation tests were performed. RESULTS: Of the 269 patients, 69 underwent embolization between March and October of 2001. Among those, we encountered technical problems in 10 (14.5%) cases. The overall number of events was 12, including spontaneous detachment (n = 5), backward slipping of the coil into the microcatheter lumen after detachment (n = 4), and undesirable coil detachment with a segment of the coil remaining at the parent artery (n = 3). No similar problems occurred among the 200 patients treated during the period between May 1996 and February 2001, when the new design coil had not yet been introduced. In vitro observations suggested that the long and stiff segment of the SynerG coil, especially the SR type, was a highly probable cause of these technical problems. CONCLUSION: Our clinical experience showed a high incidence of technical problems, and in vitro observations suggested that the new GDC designs could be responsible for them. For safe aneurysm treatment, details of embolization techniques should be modified. As an electrically detachable platinum coil, the Guglielmi detachable coil (GDC; Target Therapeutics/Boston Scientific, Fremont, CA) is the most widely used device for intracranial aneurysm treatment. Its safety and efficacy have been well documented. However, GDC embolization has potential risks related to the procedure itself, as do other techniques. In part, these could be associated with the technical skills of the interventionists and the inherent characters of the device. Regarding technical skills, associated risks can be reduced as more experience is gained (1). Our complication rate decreased with experience. However, we recently experienced several technical complications that had not been previously encountered. Moreover, the occurrence rate of these complications was considerably high. There could be several explanations, but we have concluded that the complications were directly related to the new coil designs. We herein describe the newly encountered technical problems and propose causal mechanisms in relation to the coil designs. We reviewed clinical and angiographic data obtained in 269 consecutive patients with intracranial aneurysms who had been treated with GDC embolization between May 1996 and October 2001. 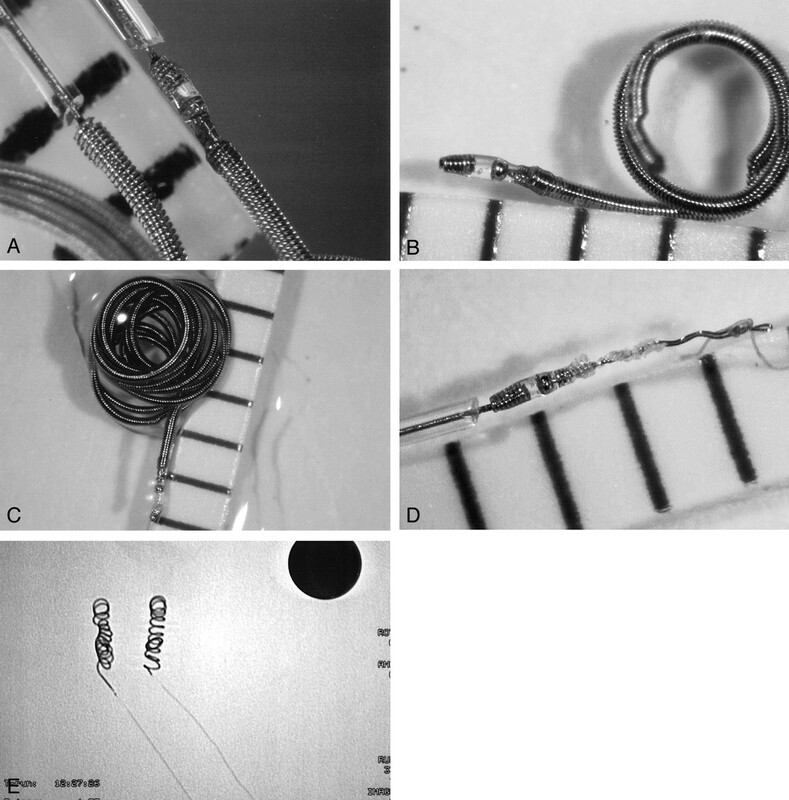 In this study, we focused on three technical problems: spontaneous premature coil detachment without applying electric current, backward slipping of a proximal segment of the detached coil into the microcatheter lumen, and undesirable coil detachment with a proximal segment of the coil remaining at the parent artery. The occurrence and clinical consequences of the problems were investigated. Other procedure-related complications, such as thromboembolism, aneurysm rupture, coil migration, and coil stretching, were excluded. “Spontaneous premature coil detachment” indicates unexpected detachment of a GDC without applying electric current. “Backward slipping of the coil into the microcatheter lumen after detachment” refers to backward slipping of the proximal coil part into the microcatheter lumen after detachment. “Undesirable coil detachment at the parent artery” refers to not being able to avoid detaching (electrically) a GDC despite that several millimeters of the proximal coil part remain in the parent artery. A newly designed GDC system with an insulated coil part (fourth generation GDC, SynerG) was introduced at our institutions in March 2001. The incidence of the technical problems was compared before and after that period. The newly designed devices were used in 69 patients until October 2001. The main purpose of the in vitro investigation was to confirm any potential relationship between the structure of the GDC and the occurrence of the technical problems. A total of 52 GDCs with or without the SynerG system, including the stretch-resistant (SR) design, Soft, Ultrasoft, two-diameter, and 3D coils were used for this series. First, structures of each type were carefully observed with magnified views by using a stereoscopic microscope. These observations were especially focused on the proximal coil segment near the detachment zone, including its length, thickness, shape, and structural composition. Second, to simulate spontaneous coil detachment, a GDC was introduced and advanced through a microcatheter into a small plastic aneurysm model. The coil was advanced until significant resistance developed, and the proximal part of the coil was deformed. Thereafter, advancement and withdrawal of the coil through the microcatheter was repeated several times until the deformed part was fractured. Additionally, manual bending of the proximal coil segment, including the detachment zone, was also tried. Third, to simulate coil interlocking, after the proximal part of a normally detached GDC was inserted into the distal end of a catheter lumen (“slipped coil”), another GDC was introduced and advanced through the microcatheter in the usual way. We focused on two points in this test: whether the second coil was freely passed despite that the detached coil had already occupied the catheter lumen and whether the two coils could be interlocked with each other within the catheter lumen. Microcatheters of 0.017-inch inner diameter (Excel-14, Target Therapeutics/Boston Scientific; and Rebar-14, Micro Therapeutics Inc., Irvine, CA) were used. 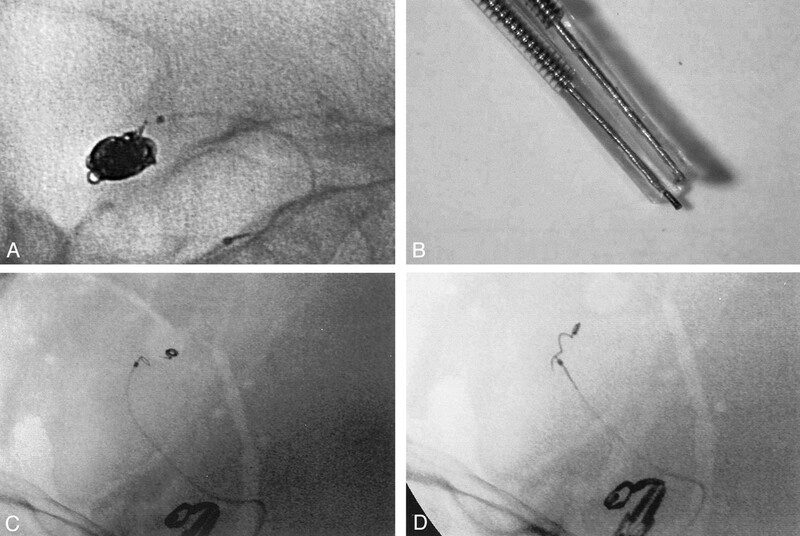 Among the 69 patients who underwent embolization with SynerG or SynerG-SR coils between March and October of 2001, we encountered at least one of the three technical problems in 10 (14.5%) cases. The overall number of the events was 12. There were five spontaneous premature coil detachments, four technical problems associated with backward slipping of the coil after detachment, and three undesirable coil detachments at the parent artery. The spontaneous premature coil detachment occurred either during multiple repositionings of the coil to make a coil basket (cases 4, 7, and 8) or during forceful insertion of the proximal part of the coil into a small aneurysm or compact coil mass (cases 5 and 6). Regarding the problems associated with backward slipping of the coil into the microcatheter lumen after detachment, the slipped coil part was interlocked with a subsequent coil within the catheter lumen (case 1) (Fig 1A–C), pulled back further by a suctioning force exerted during rapid withdrawal of the delivery wire (case 2) (Fig 1D), or unexpectedly retrieved into the parent artery while the microcatheter was slightly withdrawn (cases 3 and 4). In the cases of undesirable coil detachment at the parent artery (cases 5, 9, and 10), even with a significant advancing force on the microcatheter and the delivery wire and even after repositioning the guiding catheter for more support, we were not able to insert the last several millimeters of the coil into the aneurysm. Instead, the microcatheter was pushed back from the aneurysm by counterforce (Fig 2). We were not able to withdraw the coil for fear of coil stretching or migration of the previously detached coil mass. Backward slipping of proximal segments of the coils after detachment. A, Case 1: 54-year-old woman with basilar artery aneurysm. During coil insertion, a coil (GDC-10, Soft, SR, SynerG, 2 mm × 6 cm) was slightly withdrawn to modify its placement. However, significant resistance was felt after several millimeters had been retrieved. The coil could not be withdrawn or advanced any further. When the catheter with the coil was retrieved, the previously delivered coil (2 mm × 4 cm GDC-10) was also moved. We found that the two coils were firmly interlocked with each other. Image shows that catheter is removed with the two coils by simply pulling. B, Fluoroscopic image from case 1 shows the two coils to be tightly jammed into the microcatheter lumen. C, Magnified photographic image from case 1 shows the two coils to be tightly jammed into the microcatheter lumen. D, Case 2: 53-year-old woman with ruptured basilar bifurcation aneurysm. 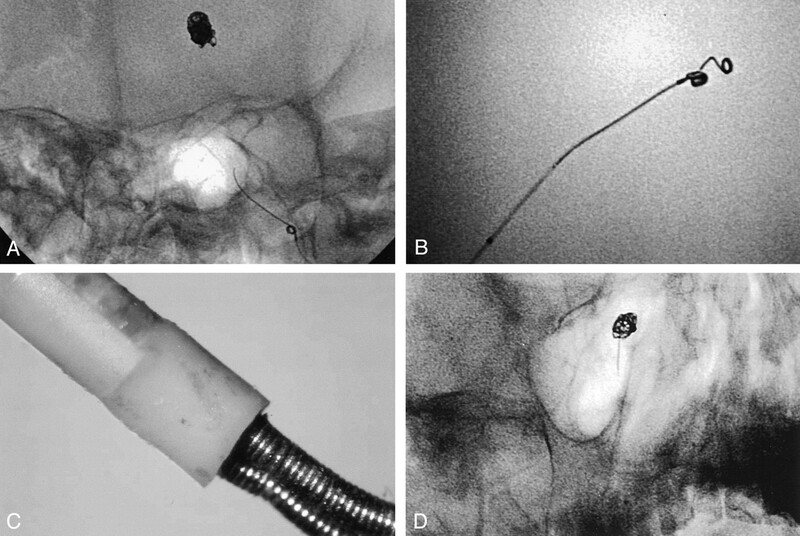 After the second coil (GDC-10, 2-diameter, Soft, SR, SynerG, 4 mm × 8 cm) had been placed and detached uneventfully, the delivery wire was slowly retrieved approximately 10 cm under direct visualization by using fluoroscopy. After that, it was somewhat rapidly and completely withdrawn from the microcatheter. Fluoroscopic image obtained immediately after the withdrawal shows that several centimeters of the coil was pulled back through the microcatheter. Undesirable detachment with proximal segment of the coil remained at the parent artery. A, Case 9: 66-year-old woman with ruptured posterior inferior cerebellar artery aneurysm. It was impossible to insert the last 2 mm of the second coil (GDC-10, Soft, SR, SynerG, 2 mm × 2 cm) into the aneurysm because of excessive resistance. Image shows that microcatheter is pushed out by counterforce. We could not avoid detaching the coil while leaving the proximal 2 mm in the parent artery. B, Final angiogram from case 9 shows proximal part of the coil within the parent artery. The clinical features and the number of coils used in these cases are summarized in Table 1. Illustrative cases are presented in Figures 1 through 3. Neither the same nor similar technical problems occurred in the 200 patients treated between May 1996 and February 2001. Spontaneous premature detachment of coils. A, Case 5: 42-year-old man with ruptured anterior communicating artery aneurysm. Significant resistance was felt while inserting the last several millimeters of the last coil (GDC-10, Soft, SR, SynerG, 2 mm × 1 cm). Because of the resistance, the coil bent at the coil detachment zone, just beyond the catheter tip. The coil was spontaneously detached. B, Magnified image from case 5 shows distal end of the delivery wire of this case (left) and a normally (electrically) detached coil (right). C and D, Case 6: 46-year-old man with ruptured anterior communicating artery aneurysm. Two coils (GDC-10, Ultrasoft, SR, SynerG, 2 mm × 2 cm and 2 mm × 1 cm) were migrated into distal A2 during the procedure. They were removed with a snare (Goose-Neck Snare; Microvena, White Bear Lake, MN). Fluoroscopic images show that one of the coils is entrapped by the snare loop. The long and straight proximal segment of the coil is paradoxically helpful for capturing and holding with the snare loop. The proximal coil segment of the SynerG GDC system is covered with a transparent plastic (polyethylene) polymer. This polymer covers the distal end of the delivery wire proximally and the proximal part of the main platinum coil distally. Therefore, the main platinum coil part is isolated from its delivery wire. The length of this polymer part is approximately 1 mm (Fig 4A). Because of the polymer, the proximal part of SynerG GDC is tapered. GDC is detached at the proximal end to the polymer by electrolysis. In our observation, after applying electricity, the whole length of the naked stainless steel wire was completely electrolyzed without exception. Photographs and fluoroscopic image show the proximal segment of SynerG GDC. One division of the ruler in photographs = 1 mm. A, Photograph shows the proximal segments of non-SynerG (left) and SynerG-SR (right) GDC. B, Photograph shows the long and straight proximal segment of the SynerG-SR GDC (GDC-10, Ultrasoft, SR, SynerG, 2 mm × 1 cm). C, Photograph shows the long and straight proximal segment of the SynerG-SR GDC (GDC-10, Soft, SR, SynerG, 2 mm × 1 cm). D, Photograph shows the long platinum wire loop to hold a 9-0 polypropylene thread loop. Note the length of the wire loop. E, Fluoroscopic image shows 2 mm × 8 cm SynerG-SR (left) and the same sized non-SynerG (right) GDC. Note the different proximal parts of the coils. The diameter of the black circle is 10 mm. The SR system is composed of two blue 9-0 polypropylene threads that were attached at both ends of the GDC within the central coil lumen. A thin platinum wire loop of approximately 2 mm in length is used to tie these threads proximally. This wire loop is fixed into a small platinum ball proximally. Because of this long wire loop, the SynerG-SR GDC has a long (approximately 2.5 to 3 mm), straight, and stiff proximal segment (Fig 4B–E). SynerG GDC was easily bent exactly at the detachment zone and easily fractured even after two or three repeated bendings (Fig 5A–C). On the other hand, the proximal part of non-SynerG GDC was very difficult to bend. When it bent, it occurred 0.5 to 1 mm distal to the detachment zone. This bending site was exactly at the distal end of the platinum metal bar that resided within the proximal coil lumen for fixing the delivery wire to the platinum coil (Fig 5D). This site was hardly fractured, because the distal coil part is too floppy to retain the bending force. 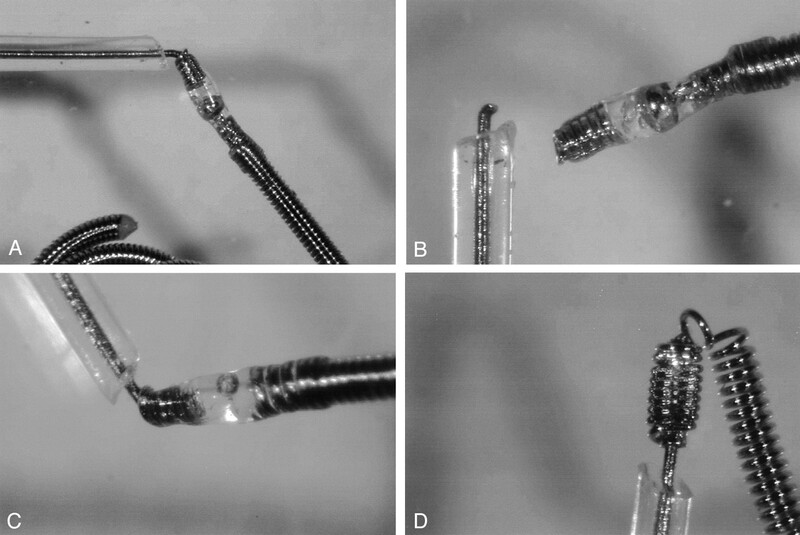 Photographs of in vitro observation for spontaneous coil detachment (simulation study). A, SynerG-SR GDC is easily bent at the detachment zone. B, SynerG-SR GDC is easily fractured with repeated bending. C, Non-SR SynerG GDC is also easily bent at the detachment zone. On the other hand, it is very difficult to bend the detachment zone of non-SynerG GDC. D, When strong and persistent force is applied, non-SynerG GDC is also bent, but it does not occur at detachment zone. Most of the time, the GDC did not advance out of the microcatheter tip while the polymer part of a normally detached SynerG GDC (slipped coil) occupied the distal catheter lumen. Sometimes, however, it did. It occurred more easily when the slipped coil was relatively fixed. The GDC-10 (outer diameter, 0.010 inch) was freely advanced from the catheter tip while the tapered proximal part of another SynerG GDC-10 resided within the distal catheter lumen (inner diameter, 0.017 inch). Sometimes, the slipped coil was pulled back further into the catheter lumen while withdrawing the newly inserted coil. It occurred by a “toothed wheel” motion of the two coils. In this case, the two coils were easily interlocked within the catheter lumen. Technical problems associated with GDC embolization could be associated with skills of interventionists. The cases in this study were treated by two interventionists (O.K.K., M.H.H.) from two hospitals. One, a senior interventionist, has performed GDC embolization for more than 200 patients with aneurysms since early 1996. The other interventionist may be regarded as a beginner, having begun endovascular therapy only 2 years ago. The technical skills of these two interventionists could be different. However, a review of our experience showed that the recent occurrence rate of the aforementioned three technical problems was similar for both. Details of GDC design have evolved with technologic advances. The most recent changes include the SynerG and SynerG-SR systems. The SynerG system was introduced to shorten detachment time and for more reliable detachment. It is constructed by adding a plastic polymer (polyethylene) between the platinum coil and the end of the delivery wire. Because the polymer acts as an insulator, electricity is not transmitted to the main platinum coil part. Thus, the electricity is focused on the detachment zone and is less influenced by the platinum coil mass. With this, detachment time is significantly shortened. Because it showed more reliable and consistent detachment, the manufacturer now produces only the SynerG system. The SynerG-SR system is designed to reduce the risk of coil stretching. Two 9-0 polypropylene threads are attached to both ends of the GDC within the central coil lumen. In our experience, coil stretching has been much reduced after use of the SynerG-SR GDC. Both the SynerG and SynerG-SR designs have definite advantages. However, as our observations show, they have several shortcomings related to their designs. Of them, the most critical one could be its long, straight, stiff, and tapered proximal segment. We think that all the technical problems of our cases were related to this segment. The backward slipping of the proximal segment of the coil into the microcatheter lumen after detachment could increase when the microcatheter tip and the proximal coil segment are straightly aligned; strong advancing force is applied, and this force is retained on the microcatheter and the delivery wire. In this situation, after the delivery wire is retrieved, the microcatheter moves toward the proximal coil segment and the proximal coil part slips backward after release from the advancing force. Thus, the proximal part of the coil becomes resided within the catheter lumen. Inadequate alignment between the catheter and coil markers can offer additional risk. The slipped coil part blocks the advance of a subsequent coil or becomes jammed and interlocked with it during forceful insertion. It may be pulled back further into the microcatheter by suctioning force exerted by rapid withdrawal of the delivery wire. In some cases, the coil may be retrieved unexpectedly into the parent artery while withdrawing the microcatheter. Sometimes, the retrieved coil seems to be firmly attached to the microcatheter tip. We think this attachment may be developed by electrically induced thrombi at the coil detachment zone or spontaneously formed thrombi near the catheter tip. The long and stiff proximal segment could easily cause bending and fracturing at the slender detachment zone. In addition, inserting this long and stiff segment into a small aneurysm or compact coil mass is very difficult and potentially dangerous. Fortunately, our cases did not have serious or fatal clinical consequences from these. However, we think that all events in our cases could have. Our clinical experience and in vitro observations suggest that several technical modifications are needed for coil embolization using newly designed GDCs. First, interventionists must take particular care when they treat small aneurysms by using the SynerG-SR GDC. It has a 2.5- to 3-mm-long and stiff proximal segment. To place this segment into a small aneurysmal sac, significant force is likely to be transmitted to the aneurysmal walls, which may be fragile. Use of the non-SR system could be desirable. However, even with the non-SR system, the proximal segment of the SynerG GDC is still long and stiff. Second, during coil insertion, interventionists need to observe carefully whether an angulation is made between the detachment zone and the catheter tip. The angulation implies that the detachment zone is being bent. Repeated coil withdrawal and advancement could snap the detachment zone and result in unexpected premature coil detachment. Even without repeated coil movement, persistent pushing force may cause the coil to bend more and become fractured. The end of the fractured delivery wire is very sharp. With retained pushing force, the tip of the delivery wire may move in an unexpected direction and injure vessels or aneurysmal walls. If premature detachment is anticipated, reducing the force by slightly retrieving the microcatheter is required. This could be achieved by retrieving the delivery wire, but when the detachment zone is already bent, retrieving it into the catheter causes repetitive bending, which can render it more likely to fracture. Third, interventionists should remember that the distal catheter lumen can be occupied by the proximal coil segment after detachment. It could occur more easily when the proximal coil part is placed straight and close to the catheter lumen (depends on marker alignment) and after difficult coil insertion. It may cause serious complications if neurointerventionists do not recognize or anticipate it. Rapid withdrawal of the delivery wire may induce further backward pulling of the coil into the catheter. Slow withdrawal under direct fluoroscopic observation is preferred. If a significant length of the coil is already pulled back into the microcatheter lumen, it can be reinserted into the aneurysmal sac by pushing it with another coil. However, forceful pushing may produce coil jamming or interlocking inside the catheter lumen. Gentle, repeated tapping of the end of the pulled coil would be better. Instead of another coil, use of a mircoguidewire may be preferred. In general, the occupancy of the distal catheter lumen by the proximal coil end cannot be directly visualized, because this segment of the coil is very short and radiopacity is often overlapped with the distal catheter marker and the coil mass. In our experience, we recognized it when we were not able to advance a subsequent coil out of the catheter tip. Fine crumples on the coil surface made by the resistance against the advancing force were always seen. There is no possibility that the coil is being blocked by compact coil mass, because even a millimeter of the coil has not been advanced out of the catheter tip and the microcatheter is not being pushed back by counter force. In this situation, both the forceful coil insertion and catheter withdrawal for repositioning could be dangerous. The former may induce coil interlocking. If some length of the subsequent coil is already inserted into the coil mass by force, its withdrawal may induce a toothed wheel-like motion between the two coils that also causes interlocking. The only method for solving the coil interlocking may be removal of the whole catheter and coil system. Catheter withdrawal should also be performed very carefully. Although the length of the slipped coil part is usually short, it can move with the catheter movement. Unexpected coil protrusion into the parent artery may occur. If suspected, the microcatheter should be retrieved slowly and minimally under direct fluoroscopic visualization to confirm the slipping. If it is confirmed, the slipped coil can be expelled from the catheter tip by gentle, repeated tapping with another coil or a microguidewire. But tension (advancing force) on the microcatheter should be released first, because it may jump unexpectedly at the moment the coil is expelled from the catheter tip. Our clinical experience showed a high incidence of new technical problems associated with GDC deployment; spontaneous premature coil detachment, problems associated with backward slipping of the coil into the microcatheter lumen, and undesirable detachment with the proximal segment of the coil remaining at the parent artery. In vitro observations of the SynerG and SynerG-SR GDC systems showed that coil designs could be responsible for these technical problems. We think that understanding the particular features of the new GDC systems is important for safe and effective aneurysm embolization. This understanding will be helpful in proper modification of details of embolization techniques. Accepted after revision April 29, 2002.